Using the H2n's Mid-Side and X/Y mics together, you can create stunning 360° surround sound recordings. Choose between 2-channel mode, which combines the Mid-Side and X/Y mics, and 4-channel mode, which records two separate stereo files, allowing you even more post-production capability. No matter which mode you use, you'll get perfectly balanced, surround sound recordings. 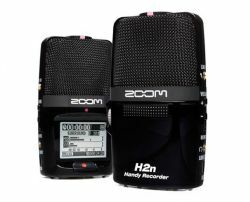 Various playback functions make the H2n ideal for music-and even language-practice. Use theVariable Speed Playback to adjust the playback speed between 50% and 150% of the original, the Key Control to adjust the pitch, and the AB Repeat function to loop a desired part. You can even use the H2n as a music player, as it supports playback of a single track or all tracks in a folder once or repeatedly. The tuner and metronome are also handy when practicing with an instrument. The H2n provides over 20 hours of continuous operation on just two standard AA alkaline batteries! This astonishing feature enhances the H2n's flexibility and convenience. In addition, the H2n can also operate using an AC adapter, which is included in the optional APH-2n Accessory Pack. Digital volume controls offer too much or too little gain, with no middle ground. The H2n's analog Mic Gain wheel allows you to dial-in the perfect amount of gain for any given application. The H2n's built-in reference speaker lets you know your recordings have been captured. With its 1/8-inch stereo output, you can also playback your recordings on your home audio system or listen to your masterpiece using your favorite pair of headphones. The H2n's 1.8-inch backlit LCD display (128 x 64 resolution) provides crystal-clear monitoring and makes it simple to navigate all of the unit's functions. Use the H2n's High-Speed USB 2.0 interface to transfer files to your Mac or PC. Once your recordings are on your computer, you can easily store, edit, playback and share your favorite creations. You can even use the H2n as a USB microphone, letting you record directly to your computer. Steinberg's WaveLab LE can be used for audio editing and professional-quality mastering. By using its precise waveform editing and high-quality processing, you can refine your recordings into finished works.